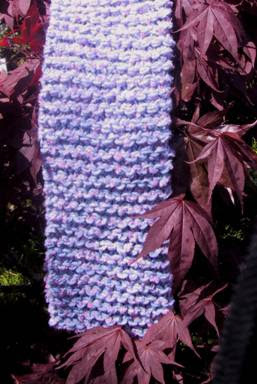 The charm of this simple garter stitch scarf is how soft it is, knit of the combination of yarns. It is almost like chenille but thrifty to knit, often a concern when knitting for charity. You can knit two scarves out of one skein each of the Bernat Soft Boucle and either Red Heart Super Saver or Caron Simply Soft. Knit every row until desired length. Bind off and weave in ends. Just want to say I love your blog. Great great patterns! Hi! I too love your blog...your patterns are so lovely, and easy to follow. I've been back and forth here so often, that I thought I should finally comment! Thank you for your kind words. They serve to perk up my day.